A review of high- and low-beta ETFs seems to indicate we have moved into a secular bull market. As long as this trend continues, add alpha by investing in high-beta funds. The definition commonly used for a secular bull market is a market that has surpassed its previous highest point and remains permanently above that point. Looking at Figure 1, below, of DIA (the SPDR Dow Jones Index ETF), the index clearly surpassed its 2000 high in October of 2006. While it was able to stay in bull market territory for nearly two years, it succumbed to the secular bear in June of 2008. The current rally traces back to October of 2011, leaving us just a month shy in duration of the prior bear market rally. The question persists, Is this truly a paradigm shift to a secular bull market, or are we once again headed for disappointment? 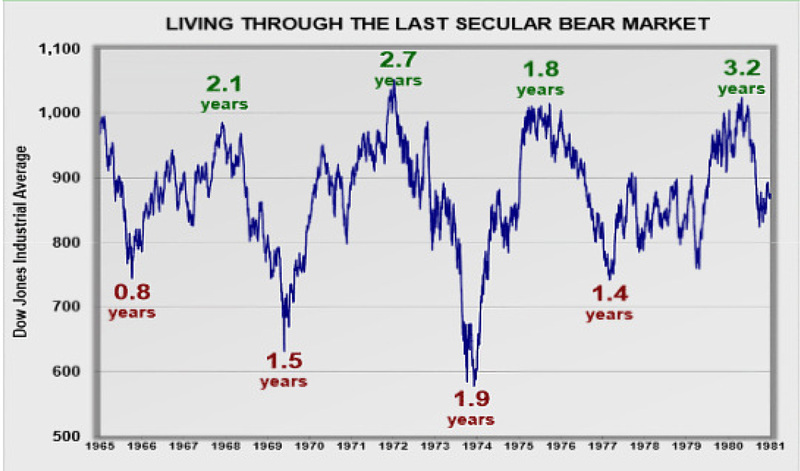 First, a look at the secular bear market from a historical perspective. Figure 2 is a graph of the Dow Jones Industrial Average during the last secular bear market. While it would seem that the current length of the most recent rally (about 3¼ years from March 2009) would imply that the market is safely in bull territory, history says otherwise. The final rally from 1977-1980 took 3.2 years before the market dropped below 1000 for the final time. There is also no magic in the “triple peak” that some analysts are pointing out. The last secular bear saw four solid assaults on breaking 1000 before the market was able to stay above that level. 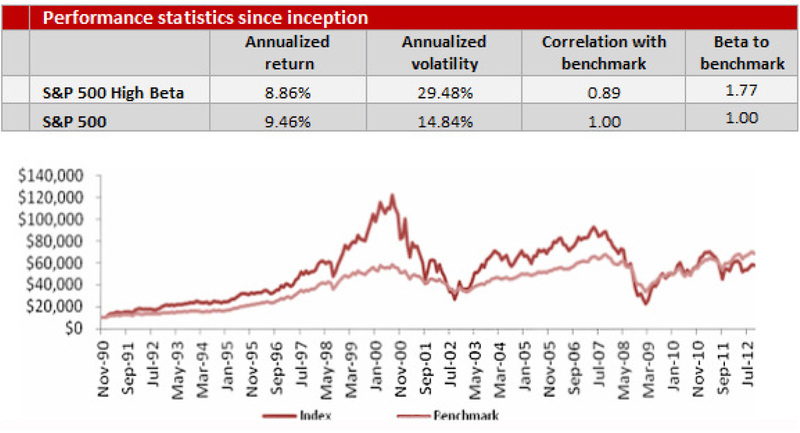 Looking at both secular bull and bear markets, in this case the bull market from December 1990 to May 2000 and bear market from June 2000 to February 2013, we can see that market performance varied greatly between the S&P 500 High Beta Index and the S&P 500 Low Volatility Index. Figure 3, below, graphs the S&P 500 High Beta Index since inception. From start to finish, SPHB underperforms the S&P 500, although it does provide a higher total return for much of the period due to its huge outperformance in a few years. But SPHB ultimately gives up its gains due to its big annual losses and finishes the 23-year period below the index (risk is clearly not rewarded). In comparison, look at the S&P 500 Low Volatility Index in Figure 4, below. In this case we see the opposite relative performance to the S&P 500. The Low Volatility Index outperforms the S&P 500 over most of the time period, underperforms during the bull market period, and outperforms during the bear market period. If an investor has the patience to invest through both a bull and bear market cycle, risk does not offer a commensurate reward. 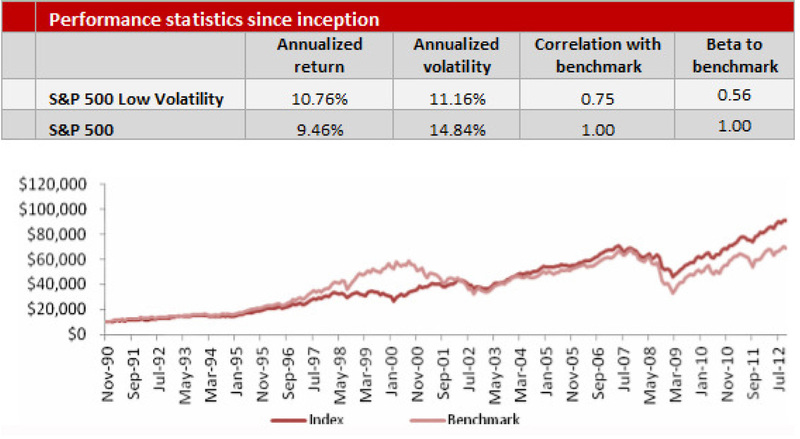 The low-volatility portion of the S&P 500 returned 130% of the value of an investor in the entire index. Risk was punished as SPHB had a return of just 88% of the entire index and just 68% of its low-volatility cousin. Risk, however, is well rewarded if one can identify when you are investing in a secular bull market vs. a secular bear market. From November 1990 through March 2000, an investment of $10,000 in the SPHB Index would have grown to $115,769 vs. $57,812 in the S&P 500. Conversely, an investment in the Low Volatility Index would have gained 232% from March 2000 through February 2013, while an investment in the entire index would have gained only 29%! While only time will tell, at this point the Dow would need to drop about 25% to re-enter the level of a secular bear market, assuming the start in March of 2000. However, a quick look at SPY (the S&P 500 Index ETF), in Figure 5 below, shows that we are just about 10% above the high of 2000. The lower yellow line shows a 12-month moving average, which reveals the strength of this year’s rally. A 10% correction seems technically to be in the cards. Or at least a few months of sideways movement to let the 12-month moving average catch up a bit. 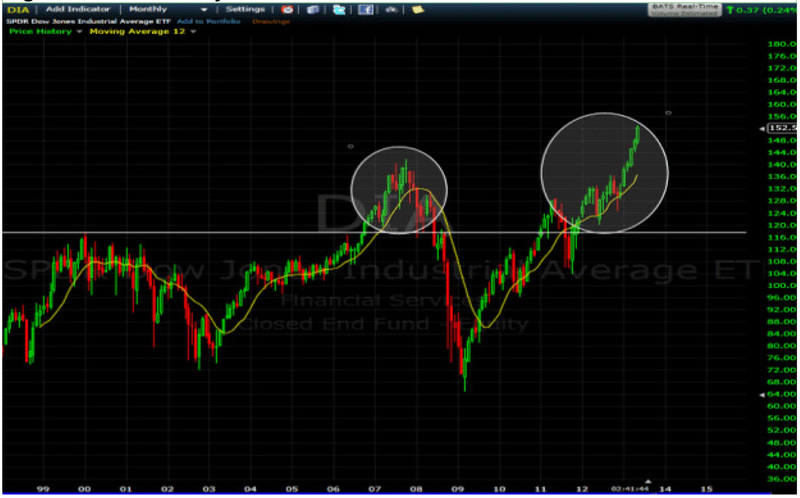 From a strategy standpoint, looking at either index, we have crossed into secular bull territory. As long as the market continues the current trend, additional alpha can be obtained by adding higher beta. One way to see if the trend continues is to follow the top sectors in SPHB: information technology, financials, and energy. An overweighting in these sectors could help boost returns. For the less optimistic, some of the larger energy names are still trading at relatively low P/Es and sport healthy dividends. Are you sure Bill we can use traditional measures, such as the long-term Secular Bull/Bear chart to determine where we are in this market? We have never in history had a market that is so manipulated as this one with Central Bank money printing and government jawboning. I do agree SPHB is currently trending higher and I love (and use) the rotation between SPHB and SPLV. 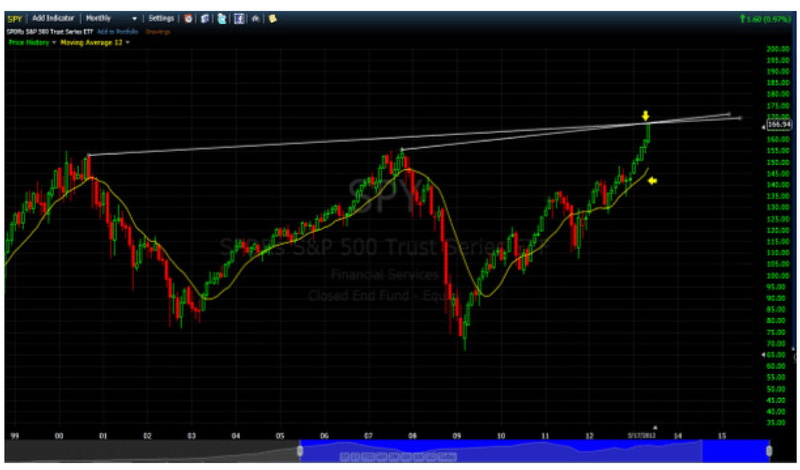 However, I am not as convinced that we have entered a new secular bull phase due to the former manipulation. Thank you for including me in the lunch & learn. I do have more concerns about P&G than you, but I understand it will take a lot of screw ups to knock that money machine off track. I just don’t like reading in the Wall St that they have lost so much management talent during the MacDonald tenure. NOTICE: B2B CFO Partners, LLC, dba B2B CFO® is an Arizona limited liability company that provides advisory and consulting services. B2B CFO® partners are independent contractors and are not officers, employees or agents of, or partners or joint venturers with, the companies they serve, nor are they Independent CPAs. Good comment…and the answer is only time will tell. While I agree that markets are incredibly manipulated by Fed excess, the other side of the argument is that there have consistently been anomalies that affect the markets, (OPEC oil embargo, WWI, WWII, Great Depression, etc.) the question is whether this time is truly different? What we obviously need is true economic growth, without the stimulus to stay in secular bull market territory. Thanks for coming to the lunch and learn, hope you enjoyed it. FYI to other readers I use P&G as an example of a great dividend stock – having paid a dividend every year since 1895. And yes there is a bit of turmoil in P&G’s management. But my position is that great companies recover. Currently they generate about $4.00 a share in free cash flow with a dividend of $2.41 and $2.14/share of cash on hand. So while they should be watched (NO stock is a buy and hold forever), there would be ample warning of financial stress preluding to a dividend cut. However, P&G is probably not a stock to buy now based on a forward PE ratio of over 17. And questions about management will likely hamper capital appreciation potential into the next few quarters at least.